High-ranking government officials not only plotted to make sure Hillary Clinton was not indicted, but had a “backup plan” to “basically frame” President Donald Trump for Russian meddling in the 2016 election, a former FBI official said. Kallstrom’s comments came in the wake of the firing of former Deputy FBI Director Andrew McCabe, who was a key player in the agency’s investigation into Clinton’s mishandling of classified material and the decision not to charge the former secretary of state. Kallstrom, who worked at the FBI for 27 years, was responding to Bartiromo’s question about whether he believed someone in the FBI was directing officials to protect Clinton. “Do you think somebody was directing them or do you think they just came to the conclusion on their own, this leadership at the FBI and the Department of Justice, that they wanted to change the outcome of the election?” Bartiromo asked. Kallstrom said officials “had a backup plan to basically frame Donald Trump and that’s what’s been going on,” Kallstrom said. New York Post columnist Michael Goodman said that a second special counsel is needed to investigate the FBI, particularly after the firing of McCabe. 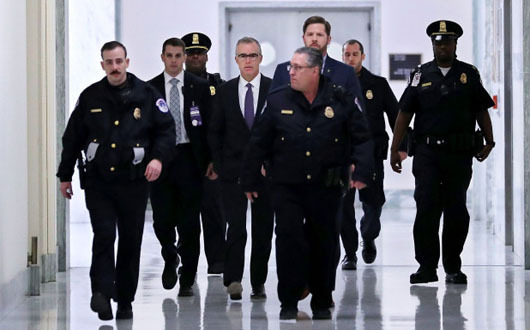 “That the drama (of McCabe’s firing) played out on the same day that news broke that the existing special counsel, Robert Mueller, subpoenaed records from President Trump’s business organization highlighted the disparity between the no-holds-barred way Trump is being probed and the slapdash, unserious effort to uncover anti-Trump wrongdoing in the government,” Goodman wrote. Meanwhile, McCabe’s firing, and Trump’s response, brought out several “Deep State” operatives who unified behind McCabe via Twitter. Comey’s book, “A Higher Loyalty: Truth, Lies, and Leadership,” won’t be released until April 17 but it is already a best-seller.